To Cite: Yin Y, Zhang P, Tan Z, Zhou J, Wu L, et al. The Association of Pre-S/S Gene Mutations and Hepatitis B Virus Vertical Transmission, Hepat Mon. 2016 ; 16(3):e32160. doi: 10.5812/hepatmon.32160. Background: HBV Pre-S/S gene mutations can occur before or after implementation of combined vaccination program. HBV Prs-S/S gene mutation is a risk factor of vaccination failure and frequently causes HBV vertical transfection. Objectives: To assess the association of hepatitis B virus (HBV) S gene mutations with vertical transmission. Patients and Methods: In this prospective nested case-control study, a total of 60 pregnant women with positive serum HBsAg and HBV DNA ≥ 107 IU/mL were divided into a case group (15 cases with vaccination failure) and a control group (45 cases with vaccination success) according to whether their infants tested positive for HBV infection. Mothers and their children in the case group were further sub-divided into groups including mothers, newborns and infant (the same newborns at age of seven months). The pre-S/S gene mutations were detected by PCR and sequenced and its association with vertical transmission of HBV was analyzed. Results: HBV genotype B was the dominant genotype in the both groups’ mothers. Each mother-child pair in case group had the same HBV genotype. There were no significant differences in mutation frequencies of HBV Pre-S/S gene between case and control groups’ mothers (Fragment 1 (M): 2 vs. 4, P > 0.05; Fragment 2 (M): 10 vs. 10, P > 0.05), or among the mothers, newborns and infants in the case group (Fragment 1 (M): 2, 2, and 3, respectively, P > 0.05; Fragment 2 (M): 10, 10 and 10 respectively, P > 0.05). Mutation site analysis of the both groups’ mothers demonstrated 108 different mutation sites in the HBV pre-S/S gene, with 105 silent mutations and 5 missense mutations including ntA826G, ntC531T, ntT667C, ntC512T and ntC546A. Among 15 mother-newborn-infant pairs with successful PCR and sequence in case group, 7 (41.17%) mother-newborn pairs, 9 (60.00%) mother-infant pairs and 3 (20.00%) infant-newborn pairs had different mutation sites. Conclusions: HBV in children due to vaccination failure was resulted from vertical transmission. HBV Pre-S/S gene mutations were prevalent and could occur before or after vaccination. Therefore, simply analyzing mutation frequency of HBV gene was not of value. To advance blocking HBV vertical transmission, future studies should focus on specific mutation sites, potentially associated with vaccination failure. Although it is a standard practice for infants born to hepatitis B virus (HBV) surface antigen (HBsAg)-positive mothers to receive active and passive immunization using hepatitis B immunoglobulin and hepatitis B vaccine immediately after birth, vaccination failure in some cases leads to vertical transmission of the disease. Vaccination failure risk factors include high HBV DNA load in the mother and HBV gene mutations, especially in the S gene (including Pre-S and S) (1, 2). S gene codes HBsAg and amino acid sequence of aa 124 to aa147 is a antigenic determinant cluster, which determines HBV serological subtypes and is also the most important antibody binding site in host humoral immune response. Pre-S gene contains an HBV immune modulatory site and hepatocyte bind site, related to HBV endocytosis. Mutations in the Pre-S gene can lead to immune escape and coexistence of HBsAg and hepatitis B virus surface antibody (HBsAb), while mutations in the S gene can cause changes in HBV surface antigen that result in forming vaccine escape mutant (VEM) via failed antibody neutralization and HBV evasion of the host immune response (3, 4). In some HBV-infected children, it has been reported that active HBV vaccine immunization can cause vaccine escape mutant (VEM) HBV Pre-S/S gene mutations, leading to an inability of HBsAb to recognize HBsAg (5). VEM HBV affects the amount of circulating HBsAg and antigen seroconversion and serves as a source of re-infection, resulting in horizontal spread of HBV (6). In newborns with HBV vaccine failure, continue implementing a combined vaccination program or switching to other options depends on whether combined vaccination is likely to lead repeated vaccination failure (7). VEMs are the cause of HBV vaccination failure and can occur before or after implementation of a combined vaccination program (2, 8). VEMs present in mother prior to infant vaccination may have been acquired from horizontal spread or via spontaneous HBV mutations. In either case, VEMs probably cause intrauterine infection of HBV, which is a main reason of immune tolerance, resulting in vaccination failure and transfer of VEMs to newborns. HBV in newborns can also mutate after vaccination as a response to pressure of combined vaccination (2). The aim of this study was to investigate the association of HBV vaccination and HBV mutation by comparing HBV mutations in mothers and newborns before and after vaccination. Most of the currently published studies on this topic have investigated the associations between HBV mutations in PreS/S region in mothers and infants or mothers and newborns with vaccination failure (3, 9, 10). However, these studies neglect the possibility of spontaneous mutations in PreS/S region in newborn or infant (3, 9, 10). Additionally, these studies do not address the occurrence of spontaneous mutations caused by selection pressure during the process of mother-to-child vertical transmission (7, 11). In this study, we addressed the potential occurrence of spontaneous or vaccine induced mutations in PreS/S region by examining newborn children both before and during a seven-month follow-up examination after HBV vaccination. In this prospective nested case-control study, HBsAg-positive mothers and their newborns were recruited from June 2008 to March 2011 in the department of obstetrics and gynecology, third affiliated hospital, Sun Yat-Sen university. Inclusion criteria were as follows; mother age ≥ 20 years, gestation age of 28 to 42 weeks, mother serum tested HBsAg-positive during a regular antenatal examination, after delivery and during follow-up visit, HBV DNA ≥ 1 × 107 IU/mL, normal liver and kidney function, no usage of antiviral, immunomodulator or cytotoxic drugs and no long-term use of glucocorticoid drugs during pregnancy. Exclusion factors included newborns without timely combined immunization within 24 hours of birth, HBsAg-positive fathers and mothers co-infected with HCV, HDV or HIV. In total, 261 mothers and 262 infants (one mother delivered twin babies) were included in the present study. Neonates were followed up for 7 months and their HBV-related parameters were tested at birth and 7 months of old. The study was approved by the ethics committee of the third affiliated hospital of Sun Yat-Sen university. All newborns received HBV immunoglobulin IU 200 within 6 hours of birth. Additionally, all newborns received yeast-derived recombinant HBV vaccine 10 μg (Beijing Tiantan biological products Co., Ltd, Beijing, China) at 0, 1 and 6 months after birth. Serum samples of femoral venous blood were obtained from newborns prior to combined vaccination and at seven months of age. Serum samples of elbow venous blood were collected from each infant’s mother within 24 hours prior to delivery. Serological markers for HBV (HBsAg, anti-HBs, HBeAg, anti-HBe and anti-HBc) were measured using ELISA kits (British branch newly creation technology Co., Ltd, Xiamen) and HBV DNA levels were measured by real-time fluorescence quantification PCR. Individual samples with HBsAg positivity or HBV DNA ≥ 100 IU/mL were considered positive HBV infection. Thus in the present study, vaccination failure was defined as persistence of HBsAg and/or HBV DNA positivity seven months after vaccination in infants who tested positive for the presence of serum HBsAg and/or HBV DNA as newborns prior to receiving the combined vaccination. Among 262 newborns, there were 63 newborns with HBsAg and/or HBV DNA positivity (positive rate of 24.14%: 63/261) at birth and still there were 15 with HBsAg and/or HBV DNA positivity (5.74%: 15/261) (namely immune failure) at seven months after combined vaccination. Fifteen mothers of newborns with vaccination failure comprised the case group, while 45 mothers whose infants were successfully vaccinated were randomly selected as successful vaccination control group. In the case group, data collected from the mothers and their children were sub-divided into groups including mothers, newborn infants and the same infants at their seven-month follow-up examination. Newborns were defined as pre-vaccination infants who had just been born. Seven-month old infants were defined as the same infant after completion of vaccination program. HBV genotype, mutation frequency in the HBV Pre-S/S gene and mutation sites were analyzed among all groups. The HBV Pre-S/S gene mutation was detected using PCR and sequencing. HBV genomic DNA in the serum was extracted using a serum genomic DNA extraction Kit (Omega Bio-Tek, Inc. Norcross, GA, USA). Because sequence of the Pre-S/S gene is large, we amplified two fragments (fragment 1: 825 bp between nucleotide sequence 2868 - 477); fragment 2: 823 bp between nucleotide sequence 375 - 1197) of the HBV Pre-S/S gene via PCR using two pairs of primers. The primers for fragment 1 were: forward 5’–GGGTCACCATATTCTTGGGAAC-3’ and reverse 5’–GGACAAACGGGCAACATACC-3’. The primers for the fragment 2 were: forward 5’–GGATGTGTCTGCGGCGTTTTAT-3’ and reverse 5’–TGCGTCAGCAAACACTTGGC-3’. The product of the fragment 1 PCR reaction amplified the Pre-S and part of S region and the product of the fragment 2 PCR reaction amplified the “a” determinant and adjacent parts of S region. PCR amplification products were identified using 1% agarose gel electrophoresis with 0.5 g/mL ethidium bromide and the UVP GDS-8000 gel imaging analysis system (UVP, LLC, Upland, CA, USA). All positive PCR amplification products were subjected to automated sequencing by Invitrogen Trading Co., Ltd. (Shanghai, China). HBV S gene sequences were compared to eight HBV genotype sequences (wild type) from Guangdong province in China using chromas.exe software (Technelysium Pty Ltd, South Brisbane QLD, Australia). The sequences were randomly downloaded from Genebank (AY817515.1, DQ448628.1, DQ478896.1, DQ478899.1, DQ478901.1, NC_003977.1, Y18858.1 and AY217370.1). Wild type nucleotide sequences were defined as DNA sequence of HBV genes downloaded from Genebank. Different sequences in comparison to wild type sequences were defined as mutated sequences. Genotypes were identified using mutation sites in the S gene region (12). Sequence alignment was performed using DNA MAN software (Lynnon LLC., San Ramon, CA, USA). 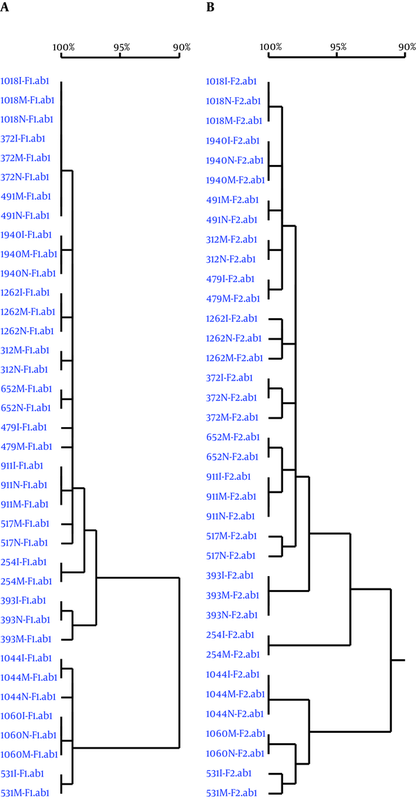 Phylogenetic trees were constructed using the homology analysis distance method by looking for different mutation sites associated with vaccination failure among groups according to previously published literature. Numerical data was analyzed using Student’s t-tests and rank-sum tests. Qualitative data was analyzed using chi square test. Statistical analysis was performed using SPSS software (Version17.0; SPSS Inc. Chicago, IL, USA). P < 0.05 was considered as statistically significant. Because the infants in the successful vaccination group were not infected with HBV, we only used samples from mothers for HBV DNA by PCR amplification in the vaccination success group. HBV DNA by PCR amplification was performed for all 15 pairs of mother-newborn-infant in the vaccination failure group. Except two newborns, HBV DNA was successfully amplified in all samples and PCR products were successfully sequenced. The only genotypes detected by HBV Pre-S/S gene sequencing in mothers in both control and case groups were genotypes B and C. Genotype B was the dominant HBV genotype in the both case (80%) and control groups (60%), while the rate of Genotype C was 20% and 40% in case and control groups, respectively. There were no significant differences in HBV genotype distribution between the case and control groups (P > 0.05; Table 1). In the case group, each mother-newborn-infant pair had the same HBV genotype and sub-genotype. In the phylogenetic tree constructed by sequencing two Pre-S/S gene fragments, 15 mother-newborn-infant pairs exhibited their own independent clusters with 99% - 100% homology (Figure 1). aχ2 = 1.978, P > 0.05. A, Fragment 1; B, Fragment 2. ab1, format of gene fragment; I, infants; M, mothers; N, newborns. Among mothers from both case and control groups, the only mutations detected were point mutations in the HBV Pre-S/S gene of which some could cause amino acid substitutions. The mutation of HBV Pre-S/S gene was detected in all cases with mutation prevalence of 100%. No large deletions were detected in either group. There were no significant differences in the mutation frequency of the two HBV Pre-S/S gene fragments between the case and control group mothers (P > 0.05; Table 2). Similarly, within the case group, there were no significant differences in the mutation frequency of the two HBV Pre-S/S gene fragments among mothers, newborns or infants (P > 0.05; Table 2). Thirty-five mutations sites were found in the HBV Pre-S/S genes of 15 case group mothers, which were not present in the control group mothers. On the other hand, seventy-three mutation sites were found in the HBV Pre-S/S genes in 45 control group mothers, which were not present in the case group mothers (Table 3). Among these mutations, 59 were located in open reading frame (ORF) and most of them were silent mutations. Only five mutations including ntA826G, ntC531T, ntT667C, ntC512T and ntC546A were missense mutations. Case ntC16T; ntT22C; ntC46T; ntA82C; ntT123C; ntA148G; ntC166A; nt C234CT; ntC371C/G; ntC406T; ntA493G; ntA519G; ntT554A; ntA574G; nt9T 61C; ntT705C; ntC735T; ntG793A; nt A 826G. ntC934A; ntC936T; ntC949A; ntG951A; ntT955C; ntA1053G; ntC1098T; ntG1101C; ntC1102T; ntG1114A; ntA1127C; ntC1126A; ntA1137G. Control ntT10A; ntC13T; ntA20G; ntA27G; ntA35C; ntC40G; ntC45G; ntG49A; ntC52T; ntT53C; ntT54T/C; ntA162G; ntA172C; ntT177T/A; ntT180T/C; ntG196A; ntT198T/C; ntT228T/C; ntG285A; ntA289T; ntT 298C; ntC312T; ntC373T; ntG388G/T; ntT454C; ntA482C; ntT491A; ntC 508G; ntC531T; ntA562T; ntA581T; ntC592T; ntC598T; ntA633G; ntT667C; ntG783A; ntA791A/T; ntG793A; ntG799G/A; ntT820C. ntT941A; ntG942A; ntG961A; ntC966T; ntA967C; ntT975C; ntC994A; ntG1002A; ntC1020C/T; ntT1026C; ntA1041T; ntT1047A; ntT1050A; ntT1051C; ntA1062G; ntT1065C; ntA1074C; ntA1081C; ntA1083G; ntT1092C; ntT1119C; nt C 1120T; nt A1122G; ntT1125T/C; ntA1138C; ntT1167A; ntG1173T. aThe counting nucleotides were based on the site of EcoRI restriction enzyme. bWild Type Nucleotide Sites → Mutated Nucleotide Sites. Among 15 case group mothers, only two shared the same two mutation sites of ntC16T and ntC46T. All other mothers in the case group had different mutation sites. Among 45 control group mothers, nine, seven and three mothers shared an identical mutation site of ntC531T, ntC508G and ntA633G, respectively (Table 3). Six mothers shared the same 8 mutation sites; ntT454C, ntT491A, ntA562T, ntA581T, ntT667C, ntA791T, ntG793A and ntT820C. Five mothers shared the same 5 mutation sites of ntA482C, ntC592T, ntC598T, ntG783A and ntG799A. Two mothers shared the same six mutation sites of ntT870C, ntT941A, ntG942A, ntT975C, ntC1020C and ntC1120T. The remaining mutation sites identified were each unique to a single patient. Some mutated sites were located within opening reading frame (ORF) of Pre-S/S genes and some were not (Table 3). There were five important point mutations that could cause amino acid change in nucleotides of PreS/S region including ntA826G (aa L → V), ntC531T (aa T → A), ntT667C (aa L → M), ntC512T (aa P → A) and ntC546A (aa T → N). Among these mutations, one case in vaccine failure group had ntA826G (6.67%, 1/15), 2 cases in control group had ntC531T mutation (4.44%, 2/45), one case in control group had ntT667C mutation (2.22%, 1/45) and ntC512T and ntC546A were detected in one case in case group (6.67%, 1/15) and one case in control group(2.22%, 1/45). The mutations of ntC531and ntC546A were located in “a” determinant cluster. The mutations of ntA826G, ntT667C and ntC512T were located in non-“a” determinant cluster in S gene. We also analyzed the HBV Pre-S/S gene mutation sites in 15 mother-newborn-infant pairs of the case group (Table 4). Among 13 mother-newborn pairs from whom sequenced PCR products were successfully obtained, 7 pairs had 15 mutation sites in HBV Pre-S/S gene, 5 mothers had 10 mutation sites not present in their newborns and 4 newborns had 5 mutation sites not present in their mothers. Additionally, three of the four newborns with unique mutation sites did not have any mutations in the HBV Pre-S/S gene that were shared with their mothers. Among 13 newborn-infant pairs that were successfully sequenced, only three infants had three unique mutation sites not present in newborns, including ntC1139A (7.70%, 1/13) in the X-S overlapping reading frame as well as ntA273G (7.70%, 1/13) and ntC512T (7.70%, 1/13) in the S region and outside the “a” antigenic determinant cluster. The mutations of ntA273G and ntC512T, not ntC1139A were located within ORF of Pre-S/S gene, ntA273G and ntC512T affected aa41 and aa162 synthesis, respectively. Among 15 mother-infant pairs in the case group, nine pairs had 25 mutation sites in HBV Pre-S/S gene that differed from each other and five infants had the same mutation sites as newborns and one mother had the same mutation sites as her newborn; two infants could not be compared with newborns because of failure in amplifying HBV DNA in these two newborns. Only one mother-newborn-infant pair had mutation sites in the HBV Pre-S/S gene that were different from each other (Table 4). aThe counting nucleotides were based on site of EcoRIrestriction enzyme. In the current study, we investigated HBV Pre-S/S gene mutations in mothers from the vaccination success and vaccination failure groups, in newborns before vaccination and the same infants followed examination at the age of seven months in the vaccination failure group. This study design avoids the selection bias of previous studies. We found that point mutations in the HBV Pre-S/S gene were detected in all mothers between vaccination success and vaccination failure groups, whereas without significant differences in the mutation frequencies of the HBV pre-S/S gene. Similarly, we found no significant differences in 15 pairs of mothers and newborns infants in the vaccination failure group. These data indicate that mutations in the HBV Pre-S/S gene are prevalent and that simply analyzing mutation frequency is not valuable for blocking HBV infection by vertical transmission, because there is no association between mutation frequency and HBV vertical transmission. Although it is unlikely that analyzing HBV mutation frequency would help prevent vaccination failure or blocking HBV infection by vertical transmission, we observed numerous different mutation sites between the mothers of vaccination success and failure groups and noted that the same mutation sites occurred in multiple cases. Our analysis also observed numerous mutated sites locating in ORF of Pre-S/S gene, including synonymous or non-synonymous mutation, and non-synonymous mutation can change amino acid (AA) translation and several mutations that are potentially associated with vaccination failure. Studies have reported that ntA826G and ntC667T are associated with antiviral drug resistance (13, 14), which can result in immune escape (2). Therefore, further studies are needed to investigate the association of non-synonymous mutation of HBV Pre-S/S gene with vaccination failure and to investigate whether specific HBV mutation sites were associated with immunization failure. Relationships between the properties of HBV, disease progression and therapeutic efficacy in HBV infections and HBV genotype have been reported (12). Many studies have shown that the B and C genotypes of HBV are primarily vertically transmitted (15-17). In the current study, both B and C genotypes were seen in mothers from the vaccination success and vaccination failure groups. However, genotype B was the most common genotype and there were no differences in HBV genotype distribution between the two groups. Furthermore, in the vaccination failure group, the HBV genotype and sub-genotype distributions were the same in newborns and infants as their mothers. Newborns and infants had their own independent cluster in the phylogenetic tree analysis, indicating that newborns and infants were infected with HBV by vertical transmission. In addition to high HBV DNA load, HBV mutations may also be associated with vaccination failure, especially mutations in the S gene. The Pre-S gene contains an HBV immunomodulatory site and a hepatocyte-binding site that is related to HBV endocytosis. Mutations in the Pre-S gene can contribute to HBV immune escape (3) and lead to vaccination failure (18). The S gene encodes the HBsAg and amino acid sequences aa-124 to aa-147 comprise the “a” antigenic determinant cluster. These sequences determine HBV serological subtypes and are the most important antibody-binding sites targeted by the host humoral immune response (6, 19). S gene mutations may cause amino acid substitutions in surface antigens, resulting in VEM due to lack of antibody neutralization (6, 19). It has been shown that active administration of hepatitis B vaccine is able to cause mutation in HBV S gene, resulting in the creation of post-vaccination VEMs (2, 19). Several studies have reported that the mutation frequency of HBV is significantly higher in children with failed combined vaccinations when compared with children who did not receive the combined vaccination treatment, especially the mutation frequency occurred in the HBsAg coding region is markedly increased (6, 19-22). However, another study (23) reported no significant differences in the mutation sites of the “a” antigenic determinant cluster of the HBV S gene in children with or without combined vaccinations. The collective results of these studies indicate that HBV mutations were spontaneous and were not due to combined vaccination. However, controversy exists regarding the association between HBV Pre-S/S gene mutations and vaccination failure. Notably, it remains unresolved whether VEMs arise due to virus acquired from the mother or from viral mutations that occur in child due to immune pressures caused by combined vaccination. Most studies only investigated the HBV Pre-S/S gene mutations found in mothers and newborns prior to combined vaccination (24). These studies have not separately analyzed infants with vaccination failure. This has led to difficultly in determining whether HBV Pre-S/S gene mutations in newborn contribute to vaccination failure. Other studies investigated HBV Pre-S/S gene mutations in mothers and infants with vaccination failure (19), but these studies did not examine pre-vaccination newborns, leading to a similar difficultly in confirming whether these mutations were acquired due to spontaneous mutations in the newborns or due to nonspontaneous mutations with the combined vaccination. Both types of investigations have selection bias, which further decreases the accuracy of these studies. Numerous different mutation sites were found in 15 mother and newborn pairs in the vaccination failure group. Although the HBV Pre-S/S gene mutation sites were not identical between newborns and their mothers in vertically transmitted HBV, this observation is consistent with a previous study (12). This result indicates that vertical transmission of HBV infections in newborns is selective. Studies have revealed that a small amount of wild type virus can exhibit an adaptive response and mutate under selective pressure (11, 24, 25). In the current study, the new HBV mutations observed in newborns may have been the result of an adaptive response to selection pressure. This adaptive response may then have gradually led to the appearance of a dominant virus. Further study is required to determine whether the observed adaptive spontaneous mutations in vaccinated infants persist and ultimately contribute to vaccination failure. There was a limitation in the current study. PCR amplification failed for two of the newborn samples, whereas multiple different mutations were identified in the samples from two newborn’s mothers and infants. Thus we failed to compare the HBV Pre-S/S gene mutations between the two newborn-infant-mother pairs. This limitation could affect the accuracy of this study to some extent. In conclusion, HBV species in newborns and infants with vaccination failure were vertically transmitted from their mothers. HBV Pre-S/S gene mutations occurred both before and after the combined vaccination. Simply analyzing the frequency of HBV S gene is not useful; therefore, further attention should be focused on specific mutation sites that are potentially associated with vaccination failure and vertical transmission of HBV. Authors’ Contribution: Yuzhu Yin and Peizhen Zhang contributed equally to this work. Yuzhu Yin, design and conduct, management and analysis of data, and drafting of the manuscript; Peizhen Zhang, collection and preparation, analysis and interpretation of data, review and approval of the manuscript; Zhangmin Tan, acquisition of data; Jin Zhou, acquisition of data; Lingling Wu, statistical analysis; Hongying Hou, study supervision. Funding/Support: This work was supported by a grant from the Guangdong province science and technology plan project (NO. : 2013B021800180).